Part of the fun of writing a math blog is designing new puzzles. I wanted to come up with a puzzle which incorporated color and logic, so here’s the result! 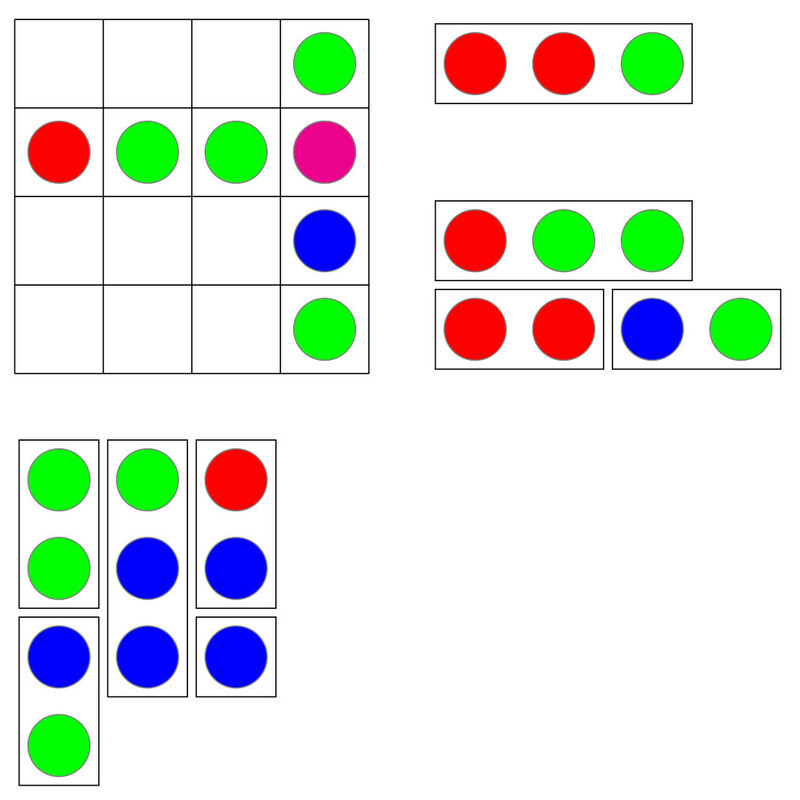 In the grid below, slide the tiles either horizontally or vertically onto the grid so that each row and column contains exactly one each of green, cyan, magenta, and yellow dots. When two dots share the same square, they are combined, so that if a green and a red dot occupy the same square, the dot is yellow, while if a blue and a green dot occupy the same square, a cyan dot is produced. In other words, overlapping the tiles is like adding their RGB values. (If you aren’t familiar with RGB values, you can experiment in the “Continue reading” section by searching for Day002 in my blog.) Horizontal tiles may only overlap vertical tiles (and not other horizontal tiles), and vertical tiles may only overlap horizontal tiles. 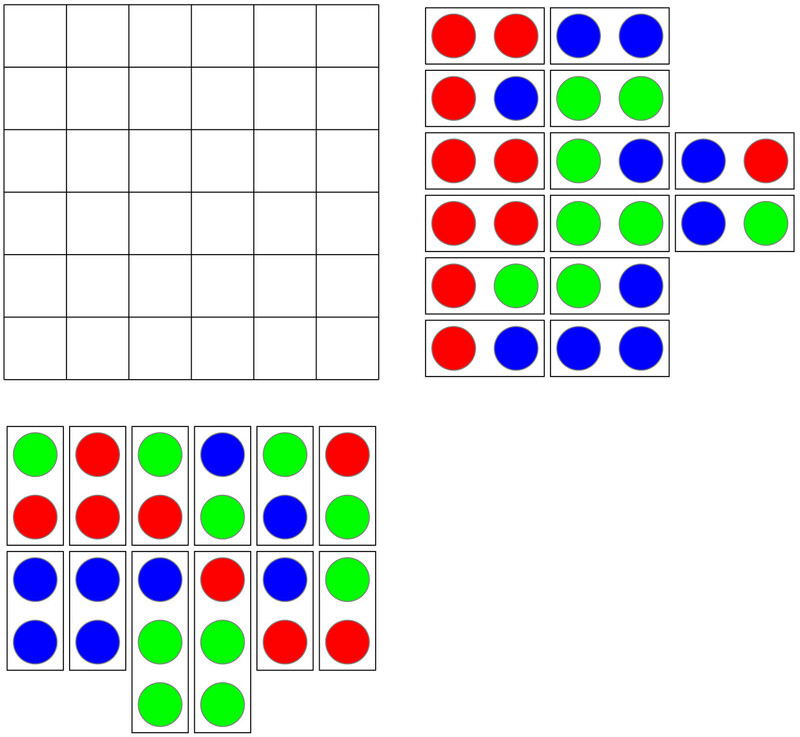 Dots of the same color may never overlap — although this condition follows from the puzzle setup. Note that green, cyan, and yellow all require a green dot, so with four rows/columns, at least 12 green dots are necessary. Since there are exactly 12 green dots, no two green dots may overlap. Similar arguments show that no two red dots or two blue dots may overlap, either. In the first part of the post, we’ll solve this puzzle so you see what’s involved. We’ll look at the design later. Now see that however the tiles are placed in Column 1, the dot at (2,1) — Row 2 and Column 1 — must be yellow. So (2,4) can’t be yellow, and therefore we know how to place the tiles in Column 4. Note how the red and blue dots overlap to create magenta. 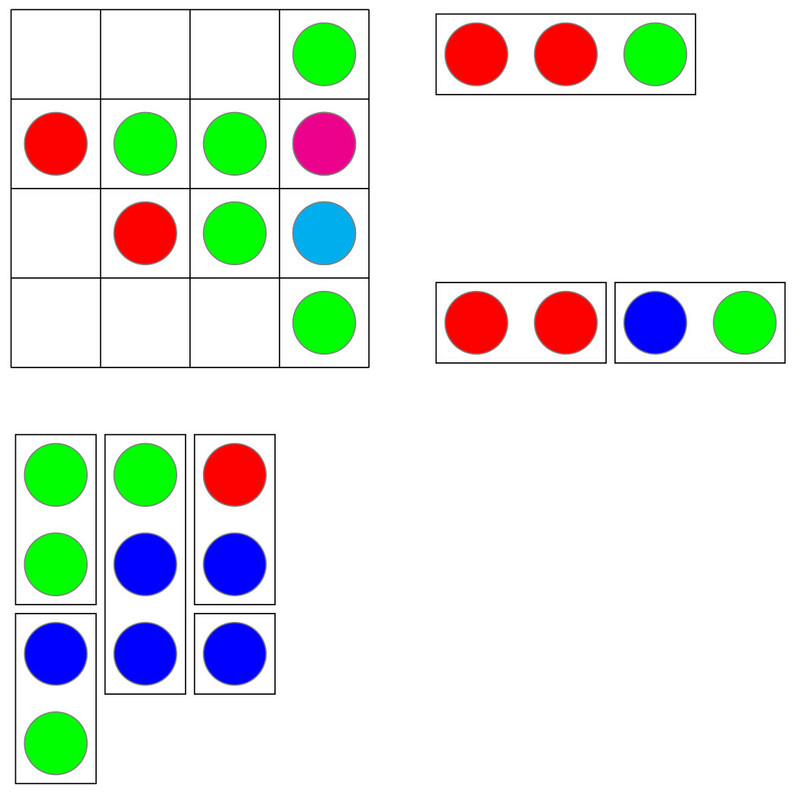 Since there are no blue dots in the completed puzzle, we must place the tile in Row 3 so that the blue dot is covered by a green one (making a cyan dot). Since green dots cannot overlap, we know how to place the tiles in Rows 1 and 4. Note the red and green dots overlapping in (4,4) to create yellow. Since green dots cannot overlap, we know how to place the tile in Column 2. See how the overlapping dots create yellow, cyan, and magenta dots. Now in Column 1, there can only one be yellow dot. So we know how to place the tiles in Column 1, and it is easy to slide the remaining tiles from Column 3. That wasn’t so bad! Just a little knowledge of color theory and a bit of logic is all you need. These puzzles are fun to create. However, there are a few issues to be aware of. The first arises since you want to avoid too many single dots — I used just one in the first puzzle, and I think that’s enough. It’s actually rather easy to create a grid with one of each color in each row and column — there are called Latin squares. The hard part is then creating an appropriate set of tiles. The difficulty lies with the fact that some squares are covered by just one tile, others by two. 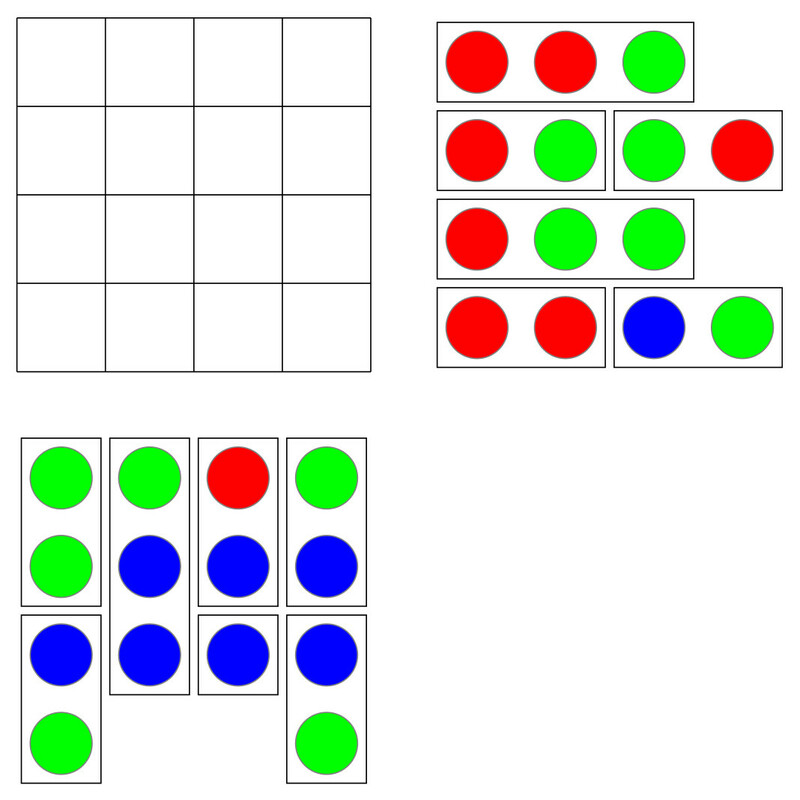 In the following small grid, the numbers represent how many dots are needed to create a color in a certain location. Suppose we wanted a vertical tile to cover a 1 and a 2 in column 3. 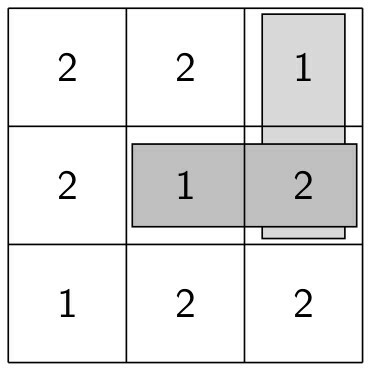 Since (2,3) is covered by two tiles and vertical tiles cannot overlap, this means we must use a horizontal tile here. But then the only way to cover location (1,2) is with a horizontal tile and a vertical tile of height 1 (since the 1’s are already covered). But this is exactly what we want to avoid! Once I realized was happening, I first designed a grid with just 1’s and 2’s and a corresponding tile set, then added the colors later. In other words, I broke a harder design problem into two easier ones. The other issue which arose was the question of uniqueness. 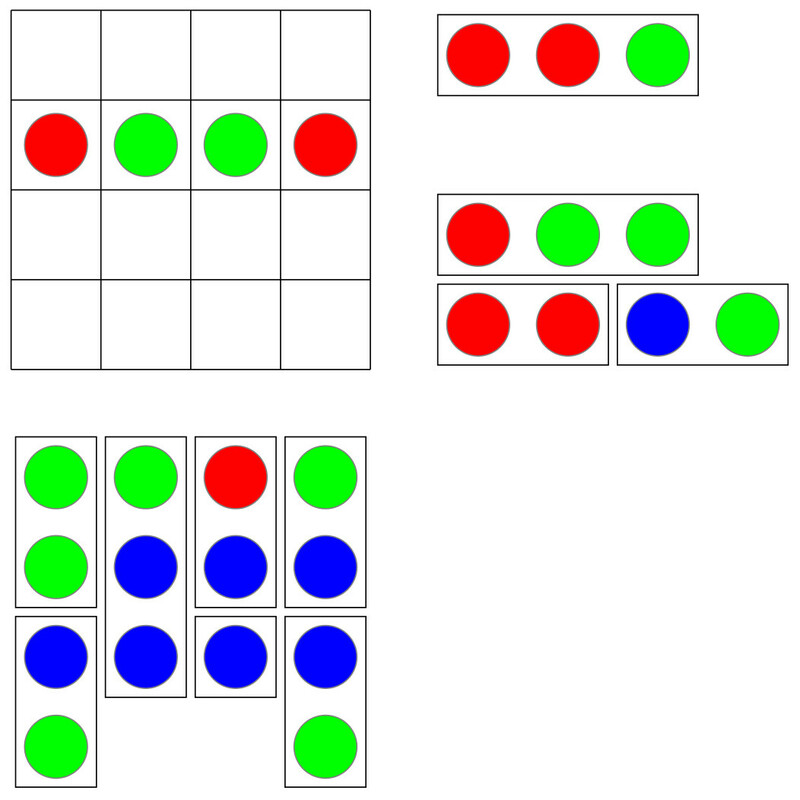 It’s desirable to have a unique solution to puzzles like this — when you design a puzzle, you clearly have one solution, but can you be sure that there aren’t any others? This is not an insurmountable task, but for the larger puzzle below, it was more involved than I thought it would be. So I leave you with a 6 x 6 puzzle to solve. 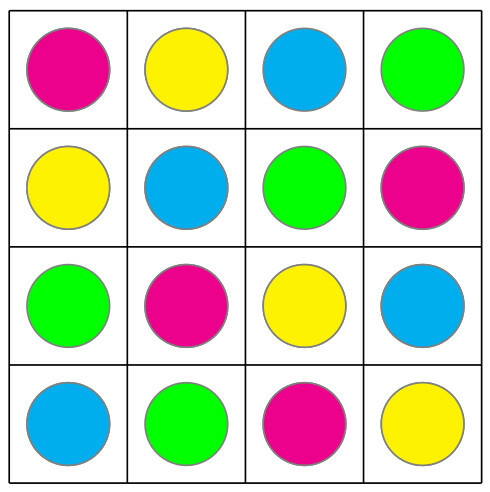 Slide the tiles so that there is a red, green, blue, yellow, magenta, and cyan dot in each row and column. As mentioned above, the solution is unique. Feel free to post your own puzzles if you create them! 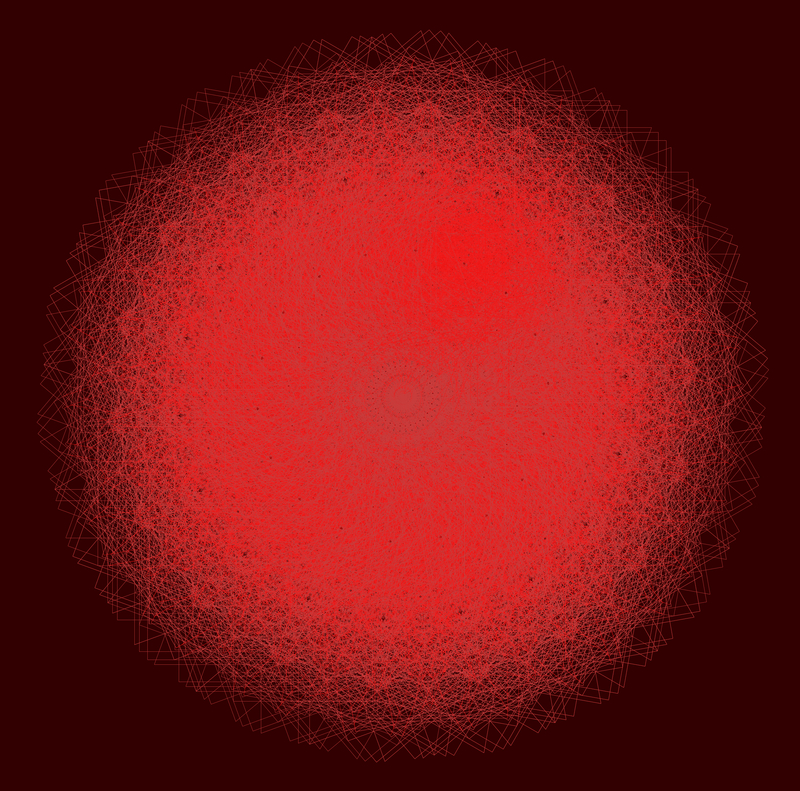 Last week, we laid down some of the mathematical foundation needed to generate fractal images. In this third and final post about creating fractals, we’ll discuss in some detail Python code you can adapt to making your own designs. Follow along in this Sage notebook. In order to produce fractal images iteratively, we need a function which returns the highest power of 2 within a positive integer (as discussed last week). It is not difficult to write a recursive routine to do this, as is seen in the notebook. This is really all we need to get started. The rest involves creating the graphics. I usually use PostScript for my images, like the one below discovered by Matthieu Pluntz. There isn’t time to go into that level of detail here, though. As far as the graphics are concerned, it would be nice to have an easily described color palette. You might look here to find a wide range of predefined colors, which are available once we execute the “import mathplotlib” command (see Line 20). These names are used in the “colors” variable. Since each motif has four segments, I’ll color each one differently (though you may choose a different color scheme if you want to). which represents converting from polar to rectangular coordinates. This is standard fare in a typical high school precalculus course. Note the color of the segment is determined by i % 4, since 0 is the index of the first element of any list in Python. All there is left to do is output to the screen. We’re done! You can try it yourself. But note that the way I defined the function, you have to make the second argument negative (compare the image in the notebook with last week’s post). Be patient: some of these images may take a few moments to generate. It would definitely help the speed issue if you downloaded Sage on your own computer. To create the image shown above, you need to use angles of 90 and -210 (I took the liberty of rotating mine 15 degrees to make it look more symmetrical). To create the image below, angles of 90 and -250 are used. However, 26,624 steps are needed to create the entire image! It is not practical to create an image this complex in the online Sage environment. To use this function, see the examples in the Sage notebook. Be careful to enter angles as negative when appropriate! Also, you need to enter a maximum depth to search, since perhaps the angles do not result in an image which “closes up,” such as with 11 and -169. But here’s the difficult part mathematically — just because our algorithm doesn’t find where 11 and -169 closes up does not mean that the fractal doesn’t close. And further, just because our algorithm produced a positive result does not mean the algorithm must close. Sure, we’ve found something that produces many results with interesting images — which suggests we’re on the right track. But corroboration by a computer program is not a proof. At the end of the notebook, I wrote a simple loop illustrating how you can look for many possibilities to try at once. The general rule of thumb is that the more levels required in the algorithm to produce a pair of angles (which is output to the screen), the more segments needed to draw it. I just looked for an example which only required 5 levels, and it was fairly easy to produce. So where do we go from here? Personally, I’ve found this investigation fascinating — and all beginning from a question by a student who is interested in learning more about fractals. I’ve tried to give you an idea of how mathematics is done in the “real world” — there is a lot of exploration involved. Proofs will come later, but it is helpful to look at lots of examples first to figure out what to prove. When I find out something significant, I’ll post about it. And I will admit a recent encounter with the bane of a programmer’s existence — the dreaded sign error. Yes, I had a minus sign where I should have had a plus sign. This resulted in my looking at lots of images which did not close up (instead of closing up, as originally intended). Some wonderful images resulted, though, like the one below with angles of 11 and -169. Note that since the figure does not close up (as far as I know), I needed to stop the iteration when I found a sufficiently pleasing result. 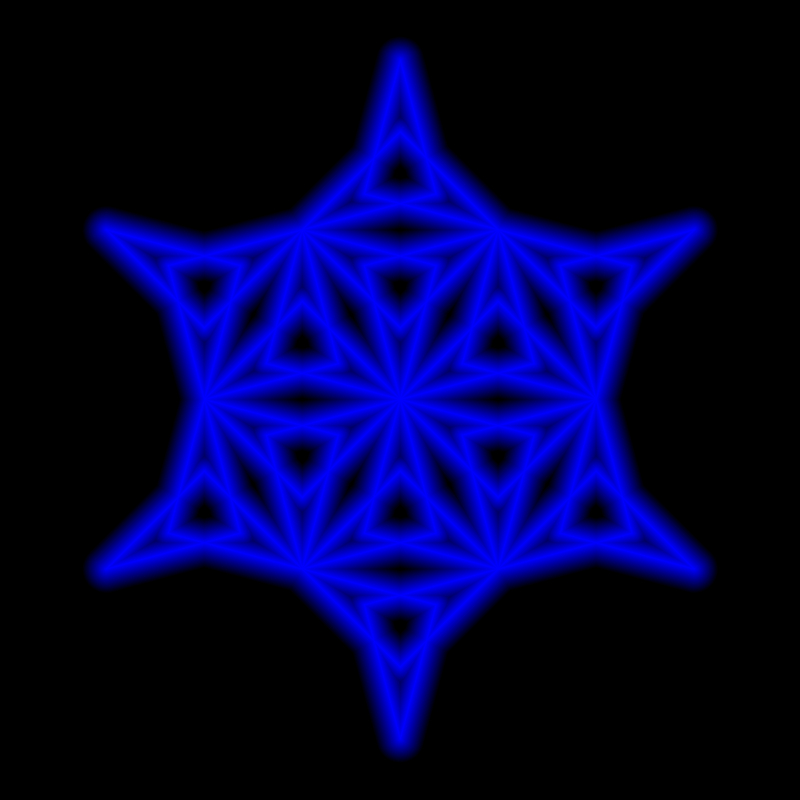 If I hadn’t made this mistake, I might have never looked at this pair of angles, and never created this image. So in my mind, this wasn’t really a “mistake,” but rather a temporary diversion along an equally interesting path. I’ve been posting images regularly to my Twitter feed, @cre8math. I haven’t even touched on the aesthetic qualities of these images — but suffice it to say that it has been a wonderful challenge to create interesting textures and color effects for a particular pair of angles. Frankly, I am still amazed that such a simple algorithm — changing the two angle parameters used to create the Koch snowflake — produces such a wide range of intriguing mathematical and artistic objects. You can be sure that I’m not finished exploring this amazing fractal world quite yet….